Although not having a car in Seattle put a crimp in my plans of hitting up all the vegan hot spots, I managed to find food within walking (or ordering!) distance from my hotel in Bellevue. I’d been planning to meet up with my brother after work each day, but he was sick for two of my remaining three nights in Seattle, so we didn’t meet up till Wednesday. On Monday, I walked just over a mile to Teapot Vegetarian House, an all-vegan (!) Chinese restaurant tucked snugly into a strip mall in Redmond. When I arrived, there was only one other patron, a wizened old man rapidly eating from multiple plates of food. After I placed my order, I noticed him finish eating… and promptly head into the kitchen, leaving me as the single diner. Nobody else appeared during my stay, although I did see a waiter preparing an order for take-out. I’m not sure whether Teapot is always quiet or Monday nights just aren’t busy, but I certainly don’t know how they can stay in business when they serve a single paying customer over the course of an hour! All that aside, the food I had at Teapot was mostly mediocre. I was craving veggies, so I ordered the Rama Garden, described as steamed broccoli, cabbage, carrots, lotus roots, napa and lots of seasonal vegetables smothered over with a buttery and smooth sweet vegan peanut sauce. Nothing too exciting, but I wanted simple. Rice wasn’t included in the meal, so I ordered a side of brown rice for $1.50. My food was pretty much the epitome of simple. The veggies were just fine, but that sauce was far too sweet for my taste. I like a bit of an umami kick to counterbalance the sweetness, but this sauce lacked any saltiness. It wasn’t bad by any means, but it certainly wasn’t a stand-out meal. The dessert, however, far exceeded my expectations. I ordered the Gula Malacca, their signature dessert. I don’t have a photo, but here’s the description: Traditional Malay dessert is given a fresh vegan treatment. Tapioca pearls marinated in a brown sugared coconut syrup, topped with a dollop of coconut sorbet and soy whipped cream, sprinkled with crushed peanuts. YUM YUM YUM. If you’re not a fan of tapioca, this isn’t the dessert for you, but I love those gelatinous blobs. They were suspended in a rich, sweet-but-not-too-sweet confection that had a bit of a coffee flavor to it (to my taste buds, at least). I got the dessert to go, so it was a little melty by the time I dug in, but it was a cool, refreshing end to my meal. Not as big as it looks! 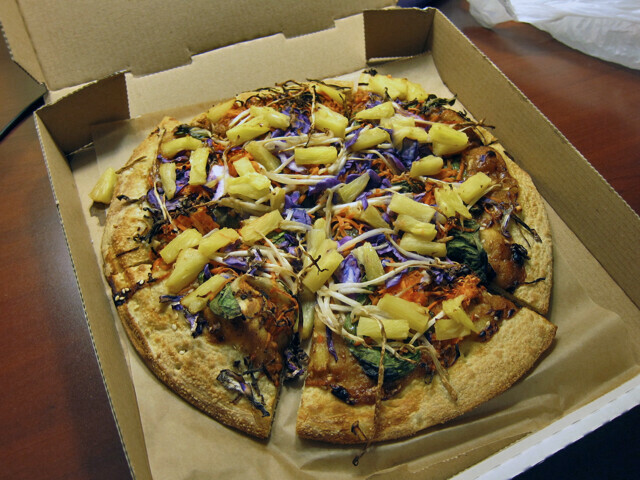 This pizza was fine, but it was nowhere near as good as the Vegan Thai Pie I get at home! Still, it was a lucky find and it filled me right up. And that, friends, is all she wrote when it comes to Seattle. While I didn’t get to visit as many of the amazing vegan eateries as I would’ve liked, I think I did pretty well for being carless. Stay tuned for the second half of S’s LA dining!